Mystical Miscellanea - including Crystal Pendants, very tactile Thumb Stones and Palm Stones, unusual Tarot Greeting Cards, Rune Stones, Semi Precious Pendants and Dowsing Pendulums. There are currently 32 items on this page. Fluorite Bullet pendant measuring 1.5inch overall, with an 18inch Silver chain. Each stone varies in colour from greens through purple. This calming and healing crystal is said to help arthritis. mounted in plain Silver complete with an 18inch Silver chain. Bullet pendant measuring 1.5inch to top of hanging loop with an 18inch Silver chain. amplifying energy and clarity, each stone will have unique inclusions or veiling. A very pretty Carnelian pendant, with an unusual centre. Set in Silver with an 18inch Silver chain. Amethyst Bullet pendant measuring 1.5inch overall, with an 18inch Silver chain. This crystal calms the mind and protects against anger and fear, it also aids meditation. 3 Beautiful Amethyst points with tiny Amethyst beads on jeweller's wire with a Silver T-bar and ring closure. Due to the natural shape of the points each necklace will vary slightly, but the central stone will measure approx. 1inch. handmade into an unusual pendant with Silver wire in a scrolling design. Includes an 18inch silver chain. This pretty little handmade pendant has been crafted using an Amethyst nugget and Silver wire in a 'Lightning' pattern. and comes with an 18inch Silver chain. Fluorite chips and unusual purple glass beads bracelet with a lobster clasp. Multi crystal Rune Stone set complete with a blue velvet bag. Pendulum with a 1.5inch Carnelian point and a 6.5inch chain. Pendulum in Clear Quartz which amplifies energy and gives greater clarity when used for dowsing. A lovely crystal which measures approx. 1.5inch on a 6inch chain. Calming Rose Quartz dowsing pendulum. 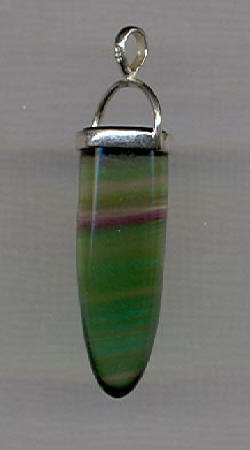 A very friendly stone, this measures 1.25inch and has a generous 10.5inch chain. Silver anklet with Citrine, said to attract money and happiness and re-inforce self-confidence. Also available in Lapis Lazuli which improves awareness and creativity. Both these anklets are adjustable from 8.5inches - 10inches. Price is for one anklet - Please state choice of stone when ordering. Wand in Rose Quartz which brings peace, calm and love. This very pretty wand measures approx. 2.5inches x 0.5inch. Palm Stone in Fluorite, a beautiful healing stone which aids concentration and brings order to chaos. These measure approx. 3inches x 2inches and weigh on average 52grms. Fluorite varies in colour and marking from piece to piece, but all stones are very pretty. Price is for one Palm Stone. Very tactile Rose Quartz Palm Stone, measuring 3inches x2inches and weighing approx. 43grms. This is the Friendship stone, bringing peace, calm and love. Calming Fluorite Thumb Stone, measuring 1.5inch x 1.25inch and weighing approx. 16grms. With a thumb shaped hollow to use when feeling stressed. Price is for one stone which may vary in colour from green through purple. Calming Rose Quartz in a choice of Thumb Stone (top) weighing approx. 14grms. or Comfort Stone (below) weighing approx. 21grms. Both measure 1.5inch x 1.25inch. Please state choice when ordering. A fun greeting card with a Tarot reading on the back, which is revealed by scratching off the gold squares. Choice of 12 cards from the Major Arcana. Card measures 7.25inches x 5.25inches and comes with a cream envelope and a guide to your reading.